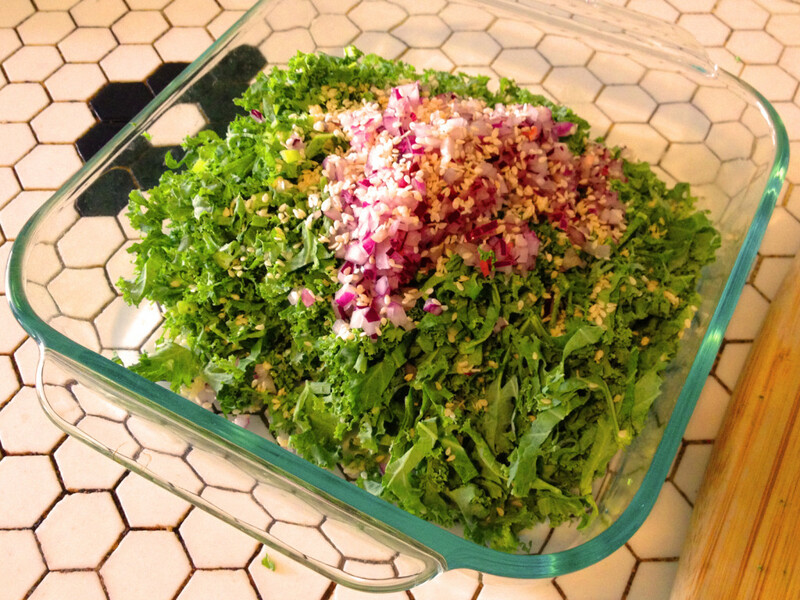 Kale Slaw with Sesame Honey Dijon Dressing – See. Food. Write. I first tasted a variation of this salad at our local food co-op several years ago, and tried to reverse-engineer the recipe. It had the fresh bite and crunch of kale, the fragrance of sesame oil, and the sweetness and tang of honey Dijon mustard. Whether I actually stumbled upon the original ingredients or not, this version has become a hit with everyone who’s tasted it. Though a fair amount of chopping is involved, this slaw is easy to make in bulk, involves easy-to-find ingredients, and can keep for about two days. It’s a great, mid-day summer snack, or a perfect first-course for dinner. About 5 to 7 leaves of green kale, depending on the size of the leaf. The kale leaves should feel crisp and have a fresh scent, not wilted or smelly. 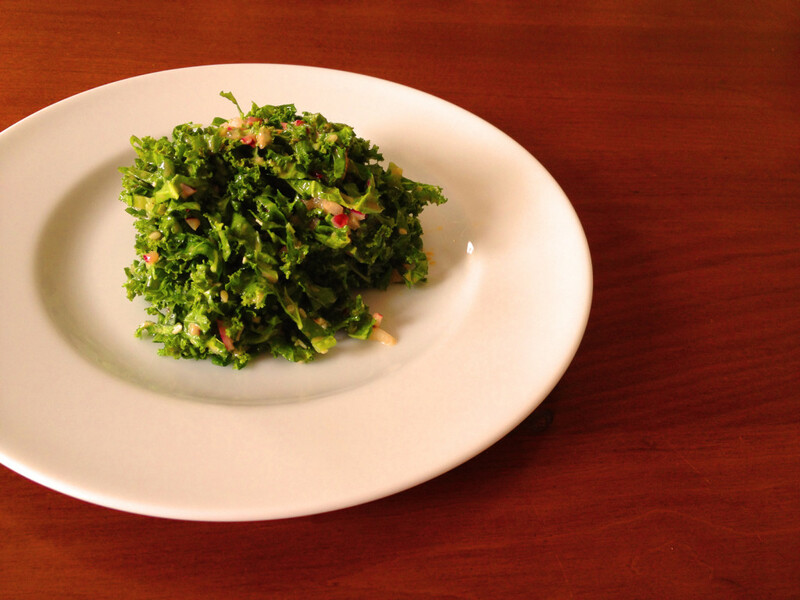 Young, tender leaves of green curly kale works best for this raw dish. 1/2 of a small red onion. Honey. Vegans, please experiment with your preferred honey substitute. Wash the kale leaves well, then pat dry with a towel. With a sharp knife, finely chop the kale cross-wise, perpendicular to the stem, to create very thin, even strips of kale no wider than 1/4 inch (6 mm) — the thinner the better. Stop chopping when you reach the end of the leafy portion. The remaining stalk can be saved for stir fry or other dishes. 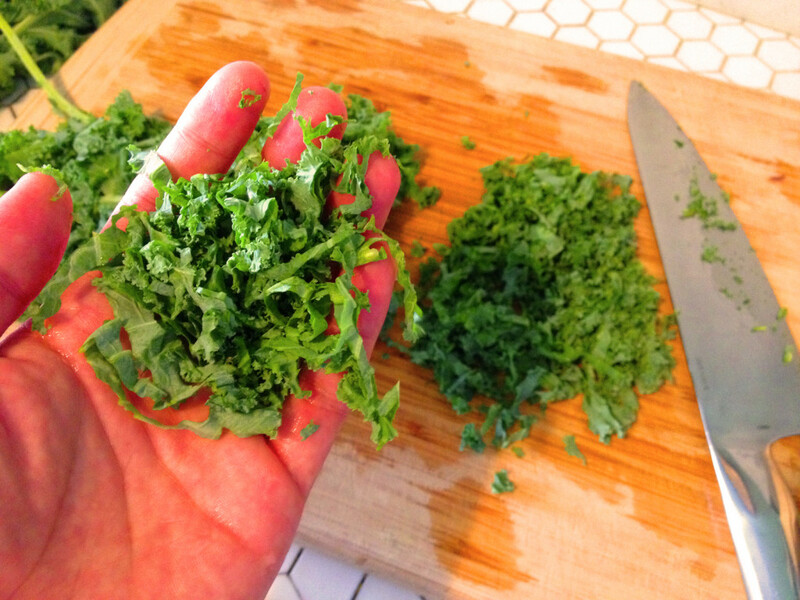 Place the chopped kale in a mixing container. 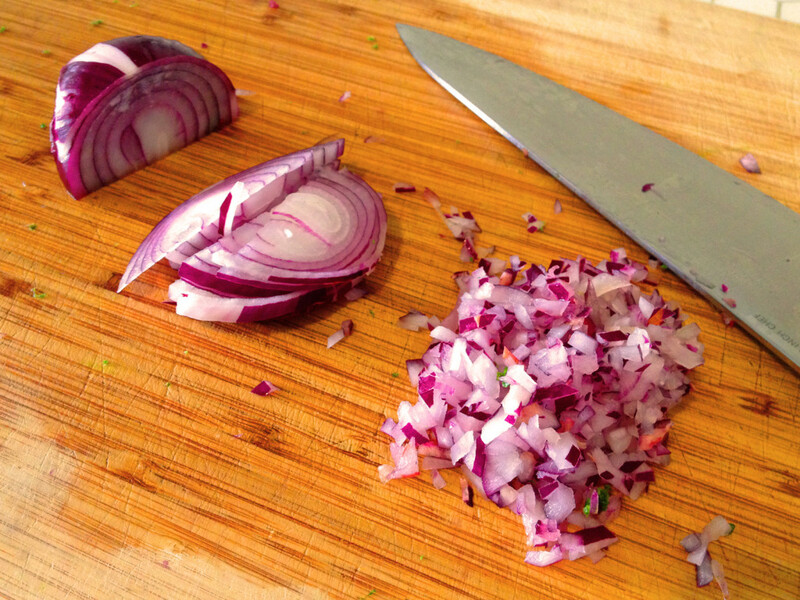 Cut one red onion in half, and finely chop into pieces no wider than 1/4 inch (6 mm). The onion is used here to give the salad some kick, so the finer you chop the onion, the less likely it will overpower the rest of the dish. Place the finely chopped onions with the kale in the mixing container, and sprinkle liberally with sesame seeds (see photo). Using a glass measuring cup or some other mixing container, mix in roughly 2 parts of Dijon mustard, 2 parts of sesame oil , and 1 part of honey. For example, mixing 4 tablespoons of mustard, 4 tablespoons of sesame oil, and 2 tablespoons of honey will make about 1/2 cup (150 ml) worth of dressing — enough for this recipe. Mix all three ingredients thoroughly with a fork or spoon — the sesame oil will start to emulsify the mustard and the honey, creating a silky, smooth-flowing dressing. Taste the dressing, and add more mustard, honey, or sesame oil, if necessary, to achieve a sweet, tangy dressing with a pleasant but not overpowering sesame scent. Add the dressing a little bit at a time and toss it thoroughly with the kale, onions, and sesame seeds. Taste a bite to see if you need more dressing, before adding and mixing more. Add enough dressing to lightly and evenly coat the slaw, but not so much that it is dripping off the kale slaw. Put your container in the refrigerator for about 10 minutes to chill the slaw. Remove and serve on a chilled plate (see photo). Add salt and ground black pepper to taste. For an additional, meaty touch, top the slaw with a crispy piece of thick-cut bacon, or chopped bits of crisped bacon. This slaw should take about 15 to 20 minutes to prepare, then another 10 minutes to chill. It may take longer if you are still getting comfortable with your knife skills, due to the amount of chopping required. This recipe should create about 4 small servings for snacks, sides, or first-course salads. Or serve as a meal with a side of sliced roast beef or flank steak (see photo). Either way, it’s a great-tasting slaw you can make ahead of time and keep chilled in the refrigerator, and dish out whenever you’re ready to eat. 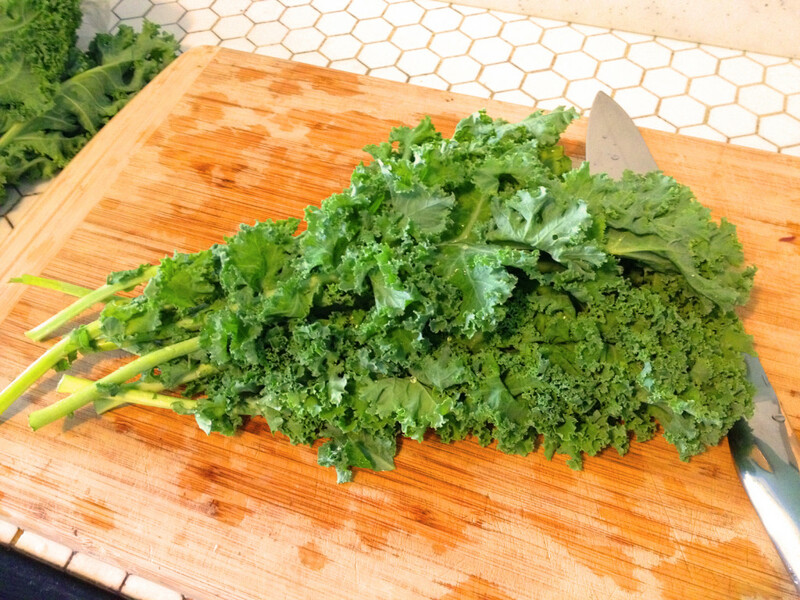 Find fresh, young kale for the Kale Slaw with Sesame Honey Dijon Dressing. Photo © Ben Young Landis. For the Kale Slaw with Sesame Honey Dijon Dressing, finely chop the kale crosswise, for the best texture and ease of eating. Photo © Ben Young Landis. The red onion should be chopped as finely as possible, so as not to overwhelm the taste of the Kale Slaw with Sesame Honey Dijon Dressing. Photo © Ben Young Landis. 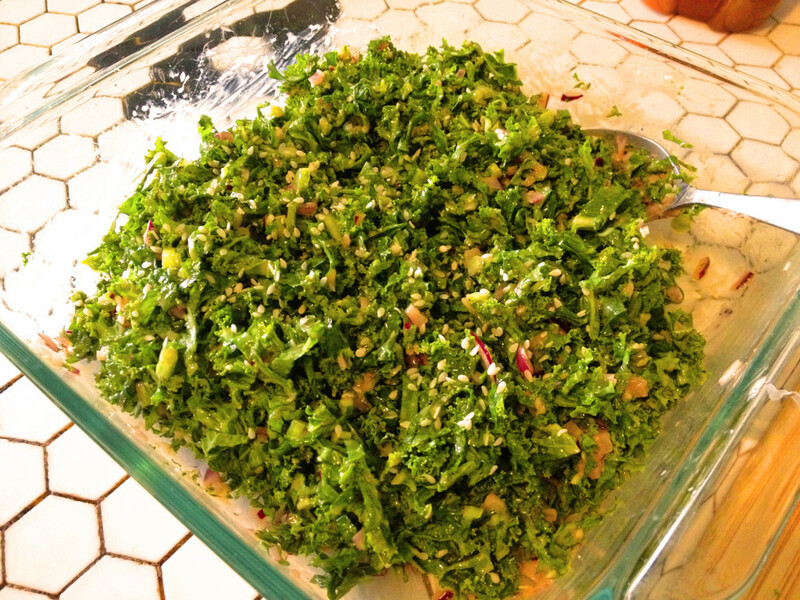 The approximate size and proportion of key ingredients in the Kale Slaw with Sesame Honey Dijon Dressing. Photo © Ben Young Landis. Adding sesame oil to the Dijon mustard and honey helps emulsify the mixture into silky smooth dressing that pours easily. Photo © Ben Young Landis. 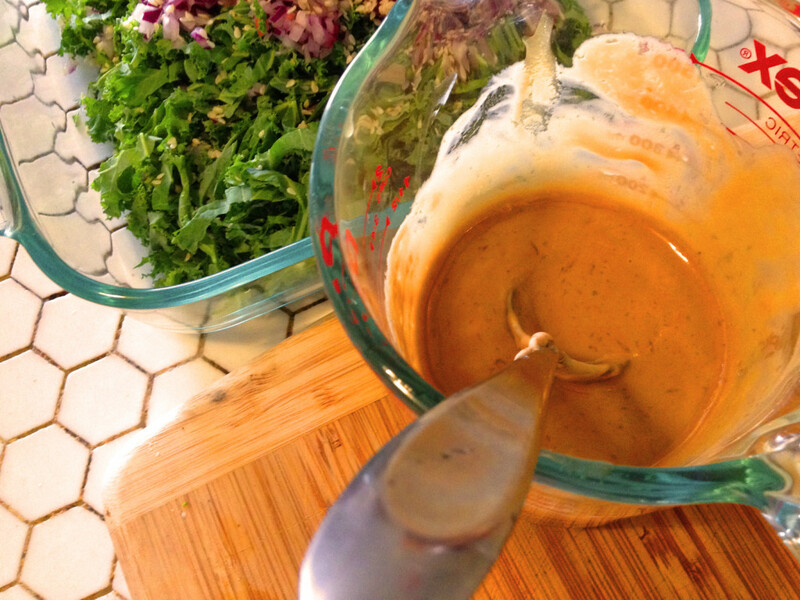 Mix the sesame honey Dijon dressing with the kale to ensure even coverage. Photo © Ben Young Landis. Kale Slaw with Sesame Honey Dijon Dressing. For an additional touch, top the slaw with a small, crisped piece of thick-cut bacon, or chopped bits of crisped bacon. Photo © Ben Young Landis. 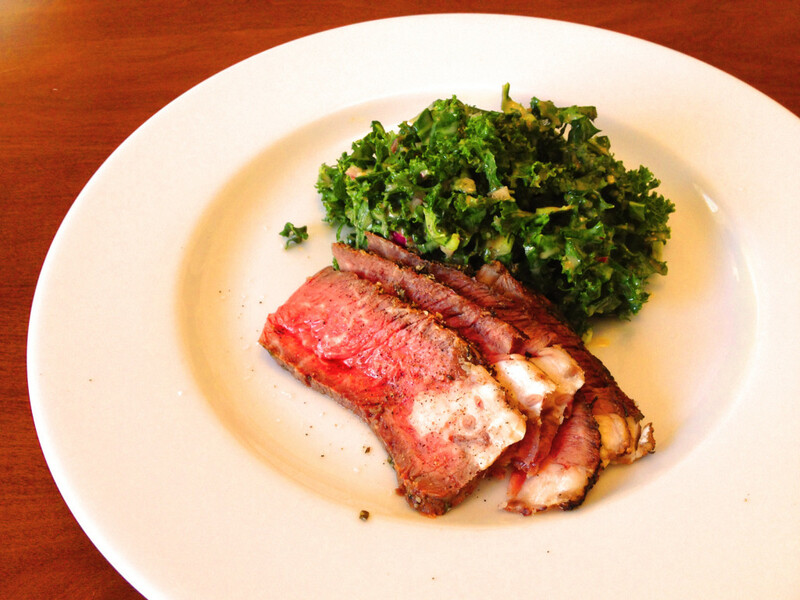 Turn the Kale Slaw into a meal by serving a side of roast beef. Photo © Ben Young Landis.